The PosHold flight mode (previously known as “Hybrid”) is a new mode for AC3.2. It is similar to Loiter in that the vehicle maintains a constant location, heading, and altitude but is generally more popular because the pilot stick inputs directly control the vehicle’s lean angle providing a more “natural” feel. When switched on, PosHold mode will automatically attempts to maintain the current location, heading and altitude. Good GPS position, low magnetic interference on the compassand low vibrations are all important in achieving good loiter performance. The pilot can control the copter’s location horizontally and vertically with the control sticks. Horizontal location can be adjusted with the the Roll and Pitch control sticks with the default maximum lean angle being 45 degrees (angle can be adjusted with the ANGLE_MAX parameter). When the pilot releases the sticks the copter will lean back to bring the vehicle to a stop. You may arm in PosHold mode but only once the GPS has 3D lock and the HDOP has dropped to 2.0 or lower. On an APM2 the board’s blue light will become solid when 3D lock is attained. On a Pixhawk the LED will become green (more details on LED patterns here). 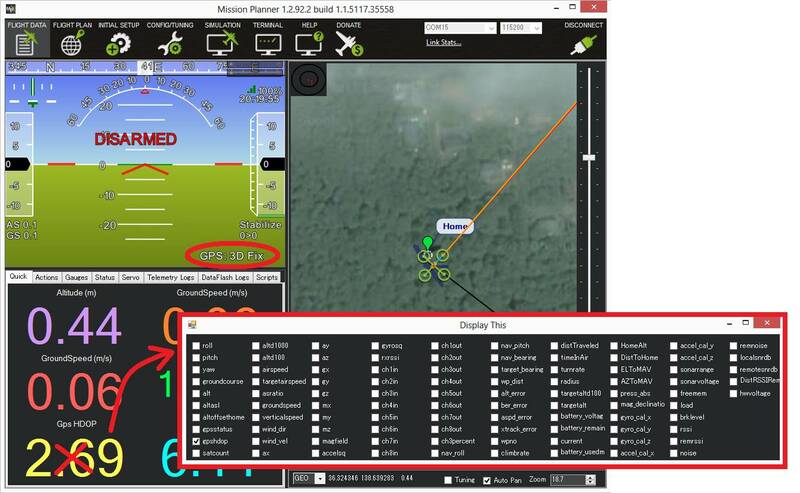 The HDOP value can be made clearly visible through the mission planner’s Quick screen by double clicking and then selecting “gpshdop” from the large grid of checkboxes.